Back to the 70s latin Fender Rhodes again! 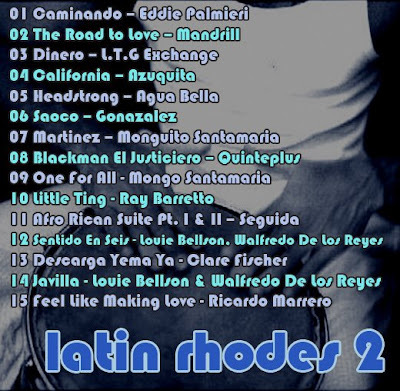 For this ninth compilation in the rhodes series, we start off with some latin funk, move through a little boogaloo and then we're deep into the latin jazz. As always, I think this is the best evahh compilation in this series, and is your perfect summer companion. Enjoy, dance and COMMENT ! took about 2 seconds of track7 to convince me to snag this. time to fire up the cd burner !! I'm normally not really into Latin. But this compilation managed to make me set my prejudices aside. There are some very fine songs on this one, such as 6. Saoco and 1 Litle Ting. Simon i've just taken some of your strata stuff but i really wanted to say congratulations on what is fast becoming my favourite blog online. The depth of research that goes into each lp is stunning and i'm learning things about records i thought i new loads about! If you get the chance by the way mate can you drop me an email at jazzyhands @ hotmail .co .uk please, i've got something i think you might like. Thanks for this one Simon. I love running into latin flavor like this. Just when you think you got everything something else comes up. Thanks for all the hard work and teaching us some new stuff. Oh man! I've been looking for that Clare Fischer track for 15 years!! 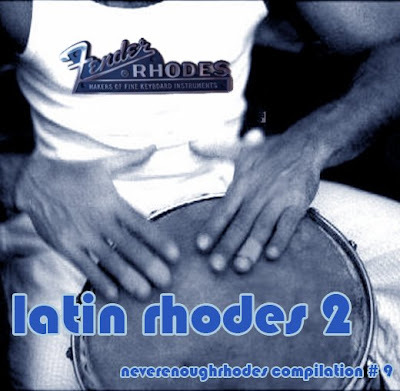 I just started reading your blog a few months ago and so far these 2 latin rhodes comps are my faves. Thanks again for keeping the bar high! ... and thanks for the Blue mitchell album Cheeba, really like it! great comp as usual simon! Looks like it's been reissued as I already checked MFS and it linked to ebay. All the links for it have been deleted it seems. I'll stick it in my wishlist for slsk, though...but I'll probably just order it online. Thanks for the tip! hi Cheeba - the MFS post has an ebay link, but there's a download link in the comments. Boy do I feel silly! Thx again, Simon! this is why you are my favourite blog! Funky as hell! I'm doing my friend's wedding next week, and I think some of these tracks just made the cut! This is some damn good stuff. Thanks. Track #10 does not properly unzip. Just downloaded it and Track 10 is fine.